Kumbh 2019 is bigger in every sense, with 15 crore people, 5,000 camps, 2,000 changing rooms, 1,22,000 toilets, this 7 weeks of the pilgrim is one of the country’s biggest marketing opportunities for brands of all sizes. The mobile charging zones lost and found centers, selfie zones, changing rooms, hand washing areas, disaster management centers, are now the so-called branding zones and brands are making the most of this mega opportunity. Whether is launching a new product, creating recall or sampling, brands are buzzing with innovative ideas to communicate their message across of the millions of people who turn up for the festival. Every year the number of brands who make their debut at Kumbh is increasing. More and more brands are exploring ways to connect with the audience while retaining the essence of the festival. Kumbh is also the ideal ground to create a desire for new products, where they are tried and “tasted”. Through its ‘Taste Election Hajmola activation’, Dabur is introducing new flavors of Hajmola. “In this role play-based activation, each Hajmola variant is being presented as a candidate fighting an election. Our volunteers are conducting extensive sampling of Hajmola variants. In the end, pilgrims are being asked to vote for their favorite,” says Phakey. Dabur Amla oil through its tagline “Baal Mazboot, Rishte Atoot” is helping out those lost on mela grounds. “Our volunteers will be moving around with badges. In case they come across a lost child, they will try to unite the child with the guardian,” says Phakey. Export-oriented textile maker Welspun India made its debut dip in Kumbh with its “Jaldi Sukhe, jaldi Sukhaye” Quik Dry towels. Brands’ bhakti towards pilgrims remains unparalleled. “They all need something to wipe their bodies with after the dip. We wanted to give the superlative sheet experience presenting Welspun towels as the ‘desh ka towel’,” says Manjari Upadhye, CEO, Domestic Business. Welspun has taken 20 changing rooms and will be offering 3,000 free trials a day hoping to touch at least 5 lakh people with its experiential connect and also selling these towels at a nominal price from their branded stall. But such high footfall every day also means more trash, most of which does not end up in dustbins. Hindustan Unilever under Red Label has set up first-of-its-kind tea vending machines that double-up as dustbins across the Kumbh city. 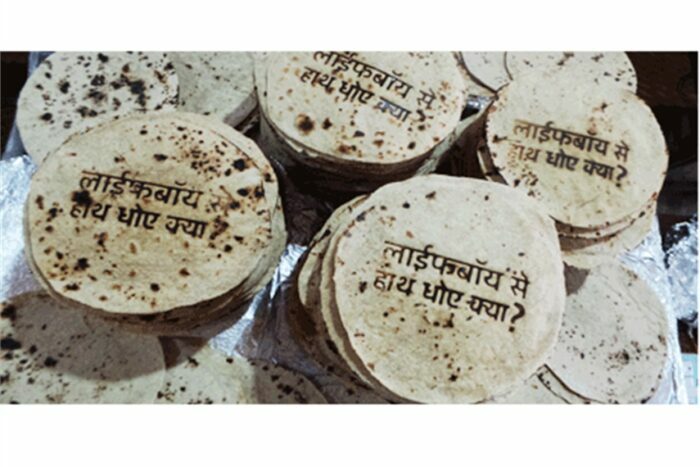 Labeled “Kachra le aao, chai le jaao (bring garbage and get a cup of tea), the machine releases a fresh cup of tea every time a pilgrim disposes of garbage in the bin, thanks to built-in sensors, thereby encouraging people to use the bins. Reliance Jio, has launched a special Kumbh Jio phone at Rs 501 (considered auspicious among Hindus). Pitched as “Sara Kumbh ho Aapke saath, jab Jio phone ho aapke haath”, its special features include family locator, “khoya, paya”, Kumbh radio and Kumbh darshan. 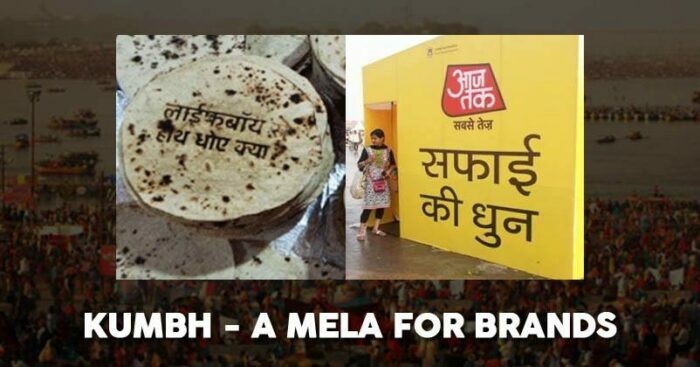 Kumbh-veteranBenckiserBenktiser (RB) is trying new things from Nukkad Nataks to sanitation mascots and handwashing stations to drive home the larger message, “Har Dharam Ka Bhojan Sanskar, Haath Dhona Har Baar”. 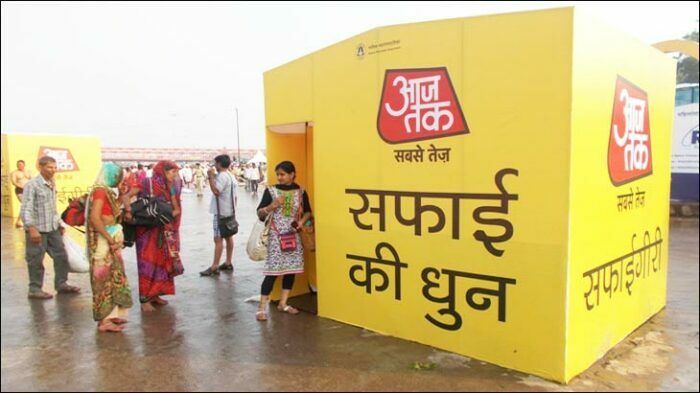 To create awareness around hygiene, Harpic launched ‘Hoga Toilet Vidhi Ka Gyaan, Toh Badhega Kumbh ka Maan’, a campaign that calls visitors to throw water every time they use a toilet as a sign of respect to the next person. “Reckitt Benckiser is supporting Kumbh with both products and services. We have provided 1,000 swachhagrahis (cleanliness workers) to Kumbh,” says an RB spokesperson. RB has provided Navik Sangh with 1,000 life jackets for people who ferry to Sangam. Dabur Vatika shampoo and Gulabari have put up ‘Vatika Lajja Kawach (changing rooms)’. SBI has provided 2,000 life jackets for safety. Birla Corp is distributing branded headbands to beat the winter chill. And Baba Ramdev of Patanjali is asking sadhus to give him “chillam daan (give up smoking)”. In Luxury: Cox & King is promoting TUTC Kumbh Mela packages wherein guests can choose from 17 luxury tents and 27 ‘super luxury deluxe’ tents. What you get are WiFi, security and paramedic on site, library, temple, yoga classes and boat cruise.